Troop 125 working on the PCT. Our youth programs are done hand in hand with our partners. Creating tomorrow’s trail advocates and stewards is an important aspect of our work. The Pacific Crest Trail was originally built by volunteers and agency partners at a time when children spent more time outdoors. The very first PCT hikers in the 1930’s were young men from the YMCA. We want to bring that back. Today, young people donate about half of all the hours put into trail maintenance on the PCT. That’s tens of thousands of hours under the sky. In the age of digital devices, PCTA directly addresses young people’s detachment from the outdoors. We believe that getting youth involved in all aspects of our work is critical. We’re doubling down and expanding our efforts to connect youth with nature and the trail. 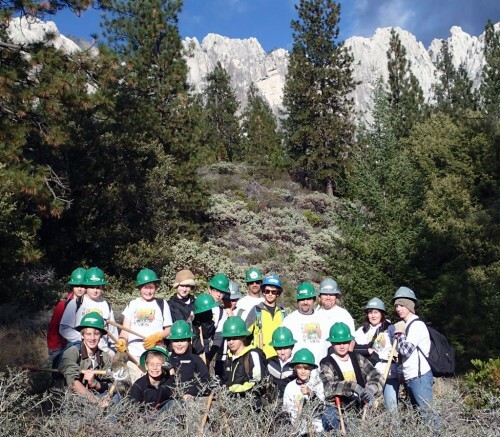 Our youth trail maintenance programs are a great example of our core belief that fostering strong partnerships plays a critical role in supporting the trail. We’re proud to work with a large number of well run youth groups and corps crews. Through those partnerships, we introduce a larger number of young people to the trail than we’d be able to do alone. For many, working on the PCT is their first job. Their work ethic is tested and held up against very measurable results – miles of trail maintained or square feet of rock cribbing installed. Just as important is their connection to the great outdoors. Through our Alternative Spring Break program, colleges and university groups from around the country come to the trail for work and play. Marquee partnerships with the Environmental Charter Middle School and High School in Southern California demonstrate our year-to-year commitment to these programs. As you travel the trail, you’ll find young people hard at work. Sometimes, they’re out for the entire summer. Thousands of young people now have a deep connection to the trail and the outdoors because of these work opportunities. We’re also encouraging families to get out and enjoy the trail. Their stories are impressive and inspirational. We involve youth at our events, in our Sacramento office and in our advocacy work. Every year, young people travel with us to Washington D.C. to engage our congressional leaders. From young long distance hikers to inner city youth on their first camping trip, we’re telling their stories on our website, Facebook and Twitter and in our magazine and e-newsletter. Join us. Bring someone young to the trail. “I really enjoy all the hands on dirty work. It’s my favorite thing about volunteering. Interested in learning more about our activities? We regularly publish youth program updates in our member magazine, the PCT Communicator. Join us in bringing young people to the trail.